CWL issued a Scoping Report to the Energy Consents Unit in December 2017 and have reviewed the Scoping Opinion which was received in April 2018. Environmental Impact Assessments in relation to the proposed development are underway, which will contribute to the final design of the proposal. The current layout iteration of Faw Side Community Wind Farm currently consists of 45 wind turbines, with a potential generating capacity of up to 315 MW of clean, green electricity. 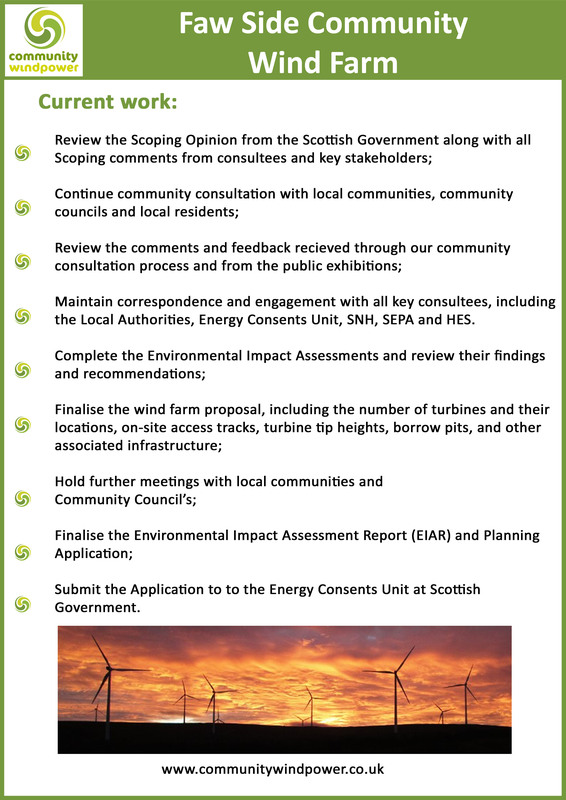 The proposed wind farm could make a significant contribution towards meeting Scotland’s renewable energy and climate change targets. Faw Side Community Wind Farm is located on the border of Dumfries and Galloway and Scottish Borders, approximately 10km north of Langholm and 25km south west of Hawick. 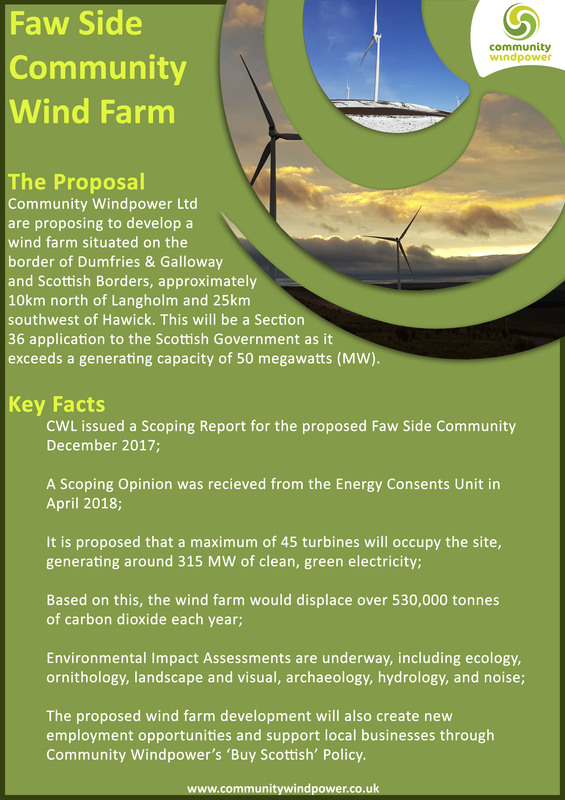 Faw Side Community Wind Farm would contribute to achieving Scotland’s renewable energy and climate change targets by providing 315 MW of green energy and offsetting over 646,000 tonnes of CO2 per annum during its operational lifetime. 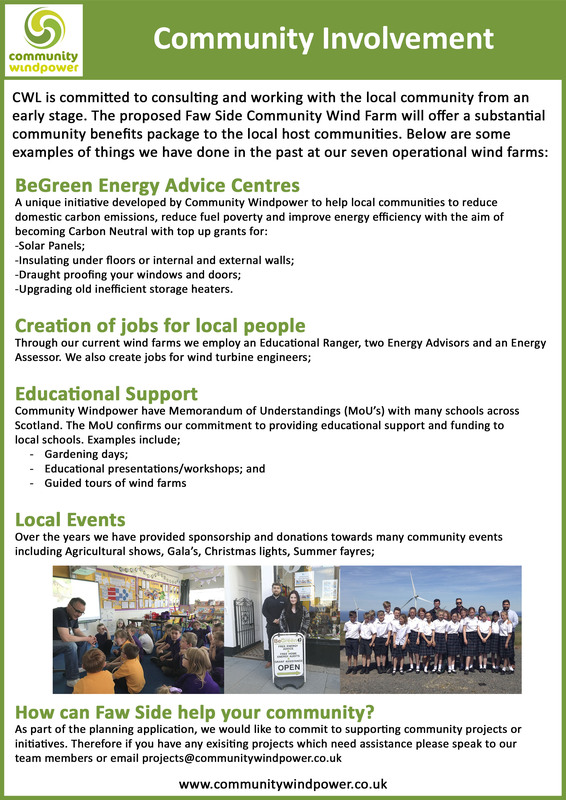 Faw Side Community Wind Farm will provide community benefit funding during the lifetime of the wind farm. In addition, Shared Ownership proposals will be considered alongside feedback from the local communities. Further details of the Shared Ownership models to be offered will be available to the local community during public exhibitions for their comment and consultation. Recently CWL undertook four local public exhibitions across the area and are now consolidating all of the feedback received and will be considering the comments given by the attendees. The exhibitions were held on Tuesday 19th of February at Teviothead Hall, Teviothead and Westerkirk Ex-serviceman's Public Hall, Bentpath. Further exhibitions were then held on Wednesday 20th of February at The Buccleuch Centre, Langholm and Ewes Hall, Ewes, Langholm.